Do you like Sweet Candy Kingdom? Share it with your friends. Sweet Candy Kingdom is a very cool and untraditional version of mahjong in which you have prepared forty different levels of difficulty. 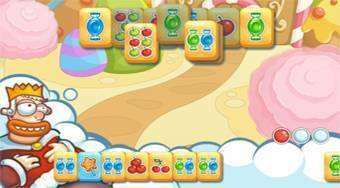 In each round, your task will be to remove all stones with candy and fruit symbols from the board. Drag the stones from the bottom of the screen onto the stones with the same symbols, feed the milky king and remove them all this way away from the board.